I have retellings on the brain right now. So you'll have to bear with me as this week you get another one--one of my favorites. 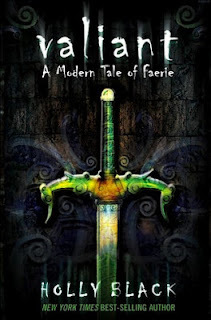 Valiant is the second book in Holly Black's excellent Modern Tales of Faerie trilogy. I read Tithe back in the day, and it immediately became my favorite Tam Lin retelling. I've been somewhat his and miss with that tale, and this angsty teen version of it worked remarkably well for me. So my introduction to Ms. Black was a fine one. When Valiant came out, I didn't know exactly what to expect given that it switched characters entirely. Things always seem to go one way or the other when that happens in a series, don't they? But I wasn't so utterly devoted to Kaye and Roiben that I couldn't make room in my heart for a few more beautiful, crazy denizens of Holly Black's urban fantasy world. And though I should have guessed, I didn't put together the fact that it was actually a Beauty and the Beast retelling until things started getting interesting with Val and a certain troll. By that time I was completely enraptured, and it has remained one of my favorite retellings ever since. As far as the covers go, the one with the sword is my copy and far and away my favorite. I like the whole snipping hair with scissors vibe on the other one, but the horned model dude is kind of freaking me out. Besides, the sword has too much importance not to feature on the cover of this book. "So you'll teach me?" Val asked. Ravus nodded again. "I will make you as terrible as you desire." "I don't want to be--" she started, but he held up his hand. "I know you're very brave," he said. "And stupid. Brave and stupid." Ravus smiled, but then his smile sagged. "But nothing can stop you from being terrible once you've learned how." I love Ravus and his role in Val's story. This little snippet of dialogue pretty fairly captures the twist in the gut you experience while reading, but it also hints at the hope underscoring all the doubt and fear. I rarely stand a chance when a woman scorned takes up a sword to fight for herself and for those she cares about. Val came through for me like gangbusters. No one could consider what happened to her to be anything other than outrageously unjust. And yes, when faced with the ultimate betrayal, she barrels off and makes a series of seriously ill-advised choices. Seriously ill-advised. I worried myself sick about her. About Val and Lolli and Luis and Dave. It wasn't easy watching them scrabble desperately for escape . . . for control. Val's journey is a rough one. But it is also such a rewarding one. In that sense it occupies the same space in my mind as Enna Burning and Ink Exchange. These are the "dark" installments in their series. The ones in which your favorite characters make mistakes. Sometimes their mistakes are so bad the consequences stretch out to encompass loved ones. They're also my favorite books in their series in each instance. Val, Enna, Leslie. These girls are so strong. They're such survivors. I love watching them pick themselves back up again, learn from their mistakes, and extricate themselves from destructive situations. Even if they are of their own making. Especially if they are. It is these incredibly human elements that make these fantastical stories of death and faeries and love in dark places soar. It is Val's story that is paramount in this version of the tale. The fact that there are lessons in sword fighting (obviously), a sweet romance, and a gritty mystery make it that much more the whole package. I enjoyed Valiant so much, I missed Val and Ravus and that crystal sword for weeks after finishing it. While not for the faint of heart, it does such a lovely job of contrasting the flaws in Val and her companions, the bleakness of their lives, with the sudden beauty of finding you're stronger than you believed. And for that it has my heart. To quote Val, "and it was perfect, was exactly right, was real." This sounds amazing! I've always been curious about this series, but the covers always turned me away. That excerpt= awesome. Melanie, yeah, the later covers have not been awesome. Give them a shot. I thoroughly enjoyed them. Sandy, I'm glad to hear there are other early fans out there. And that is exactly why I love Val and Leslie. They save themselves! Melissa, yup! I'd love your take on TITHE. Each one of these three have their own distinct flavor, and IRONSIDE brings all the characters together in a really great finish. Shockingly, I have read NOTHING by Holly Black. But the notion that these are retellings and the comparison to ENNA BURNING have me hooked. Jessica, lol. Well, this is the place to start! I think it's an apt comparison. I'm always defending ENNA to rabid GOOSE GIRL fans. I love both books, but ENNA will always be my favorite. Same goes for VALIANT in this series. I love the Modern Tales of Faerie. And you're right to connect this one to Enna Burning and Ink Exchange. I hadn't made that connection before, but it's so perfect. I wrote a Retro Friday review this week, available here. Liv, I'm glad it makes sense to you as well. Not just my mind making crazy leaps. So pleased you wrote a RF post this week! I am really going to track that one down. Oh, I've only read Tithe and Ironside and really liked both and OMG A CRYSTAL SWORD WHATTTT? How the heck did I miss Valiant, I will have to read that one soon. Also? I totally had no clue these were retellings. I for real need to read Tam Lin. April, you skipped VALIANT?! Whaaa? lol. Think it'll work for you nicely. And, yeah, Holly Black has a great, subtle hand with her retellings. Love them. When I had thought this was another fairy series, I had been ready to ignore it, but when I recently realized that Tithe was a Tam Lin retelling, I become much more interested. Also I've really been enjoying Black's Curse Workers series, which has me ready to read more. I am SO with you on loving the 'dark' installments of series. Ink Exchange and Radiant Shadows were by far my favorites of the WL series, and as I'm a total Beauty and the Beast fan girl, I am sure I'll love Valiant! Heidi, I'll echo what Diana said below. This series is SO not your run-of-the-mill fairy series. They're pretty much what I compare all the newer ones to. They're also real urban fantasy, which I find can be hard to get in YA. Oh, Heidi, these are hardly "another" fairy series. Tithe came out in 2002, a good half-decade before fairies hit the YA scene with a bang. I read VALIANT in 2005 -- my first Holly Black, and still my favorite (though the White cat series is giving it a run for its money, and I can't wait for the full length Coldtown book!). Why have I not started WHITE CAT yet, Diana? Why? I dunno! I haven't finished it myself, since I've been so bogged down. But it's perfect timing -- the last one is out now. Precisely. I love it when that is the case. I've never heard of these books before, thank you! Shane, oh, it is my pleasure. Believe me. I do hope you enjoy them.